I’ve teamed up with Tom from PSDFan to release an exclusive Texture Pack. The set contains 10 wood textures which are all 3264×2448 in size. You may use them in commercial and personal projects. I decided to release them not on fudgegraphics but on PSDFan is expand my blog. It enables me to reach my readers as well as new ones. This is the first time I tried this method and I hope it will help me (and Tom) grow. While you’re over there I would suggest to read my interview on PSDFan. You might learn something new about me. Click on the preview image to get to the download link and see a preview of each texture. I don’t know anyone who doesn’t love free stuff. Well I love it, and I enjoy sharing my free resources with you. Ever since I read BittBox’s tutorial on how to make awesome grungy paper textures I wanted to do it myself. Finally I found the time to play with it. Once I had started there was no holding me back. I was looking through all my old paper stocks to find some more special textures to scan and tweak in Photoshop. In order to achieve an even grungier look some of the paper sheets were “marinated” in tea, folded and dried before scanning them. To be honest these freebies are the ones that took the longest to complete, but it was good, although slighlty dirty, fun to make them. I hope you enjoy them. As always I encourage you to send me your designs as I am really curious as to what you used them for. It’s time again for another set of free textures. 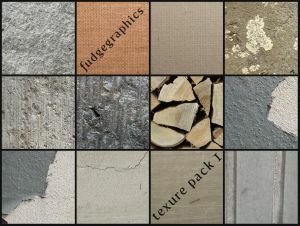 The Urban Texture Pack contains 25 large textures of concrete, walls and basically everything I could find in the lovely city of Luxembourg. I should really make a habit out of taking my camera weherever I go. At first I didn’t find any interesting textures, but soon I had to worry about not running out of batteries as I was shooting like crazy. The textures are ideal as overlay to give a slight grunge feeling to your art (a technique I apply quite often). Whatever you’re gonna use the textures for I hope you have fun with them. Feel free to send me your designs. I’m always curious to see how my freebies have been put to use. Download after the jump. I’ve just updated my flickr account with 21 free textures for you to download. All photos were taken on Saturday in London. It wasn’t planned or anything. As a matter of fact I went to the Tate Modern Museum to take the “Street Art” tour. There are supposed to be about 15 artworks to be seen in the streets surrounding the gallery. Either I’m blind, can’t read a map or most of the artwork have already dissapeared, cause I only discovered like 3 or 4. I was really excited about this “exhibition” but ended up dissapointed. Anyways, it wasn’t all for nothing. Since I got my camera with me I used the time to shoot some grunge textures which I want to share with you. Rather than putting them in a zip file I organized them in a flickr set so that you can download the individual textures you like. Enjoy! At the moment there are 2 resources packs available: illustrator pattern swatches and textures. Click the image to get to download.